USDCAD dropped through 3 big figures as the Canadian dollar rose to its strongest in nearly a year versus the U.S. dollar. As expected the Bank of Canada raised interest rates by 25bp and upgraded their 2017 and 2018 GDP forecasts. They attributed the slowdown In inflation to temporary factors and while Governor Poloz said they need to carefully gauge the impact of higher rates, he also there is “no doubt interest rates will be higher over time.” With the recent improvements in data, the “economy no longer needs as much stimulus” and the upward revisions in GDP showed the output gap closing sooner than they previously anticipated according to Deputy Governor Wilkins. Poloz now sees inflation returning to their target level within a year. These unambiguously positive comments created a second wave of CAD buying that should take USD/CAD down to 1.25. 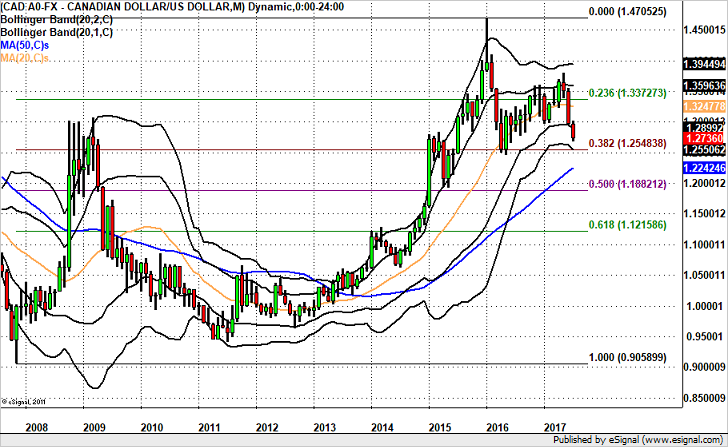 We have to turn to the monthly charts to find support for USD/CAD. Although there will be some retraces, the next stop for USD/CAD should be 1.2550, the 38.2% Fib retracement of the 2007 low to 2016 high. On the upside, expect sellers to come in between 1.2800 and 1.2850.